Bedbug bites often occur at night, because the insects are nocturnal, with peak activity just before dawn. Bedbugs are resourceful and opportunistic. In a well-documented daytime outbreak, its victims were all women who rode a particular English tram. Each woman had a peculiar band of erythema studded with bullae on the back of both calves. As reported by Leibold et al,  a disseminated bullous eruption with systemic reaction caused by C lectularius may occur, but this is rare. Most commonly, exposed skin is affected. 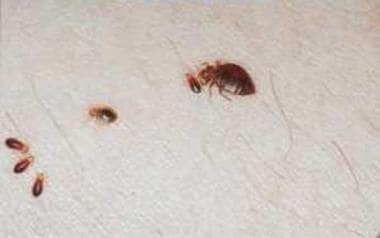 Bedbug bites are painless, but pruritus and purpuric macules may appear. Their distribution depends on the bite site, whether it be the face, neck, hands, arms, lower legs, or generalized; however, they often are evident on the face upon awakening in the morning. 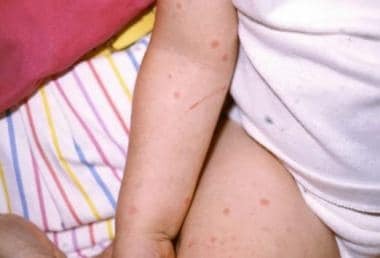 Bites are often noted in linear groups of 3, sometimes called "breakfast, lunch, and dinner," evident as erythematous papules, sometimes with a prominent urticarial component in predisposed individuals. Go to Papular Urticaria and Acute Urticaria for complete information on these topics.